Maraschino cherries are my favorite vegan ice cream topping. 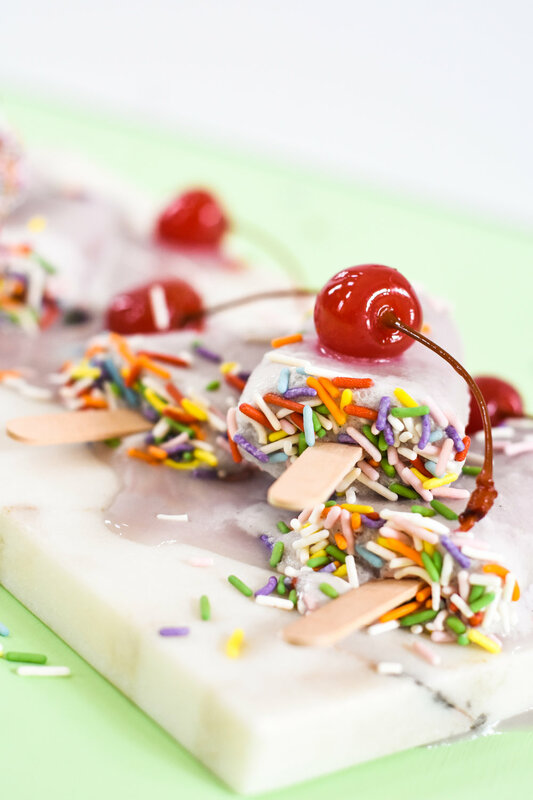 Rather than just having the cherry on top, these popsicles are filled with super sweet marachino cherry juice. I'm sharing this vegan cherry coconut popsicle recipe with So Delicious Dairy Free with you here on the blog. Ok, I need to be honest with you. These popsicles are so good that I got a straw + tried to drink this melted juice off of the cutting board. I know, that sounds desperate. Desperate times call for desperate measures + I just didn't want to see this sweetness go to waste. I love feeding my family So Delicious Dairy Free products because they use state of the art allergy testing to make sure each batch is free of major allergens that aren't included in the ingredients. My son, Bowan, has multiple food allergies + I like to know what I'm feeding him. Trace amounts of allergens could cause him to have a reaction. I want to enjoy our ice cream rather than worry about his safety based on a brand of food I chose to buy. Also, we don't go out to ice cream shops because... peanuts, everywhere... The last time I was in an ice cream shop, two years ago, I looked back at the counter + floor + there really were peanuts all over the place. So, we use trusted So Delicious + enjoy our vegan ice cream at home. Measure all ingredients + pour into blender. Blend on high for 1 minute. Next, drink it straight out of your blender pitcher. Just kidding. Well, actually, I really did do that. Next, pour into popsicle molds. Place in the freezer. Freeze for 15 minutes. Then, add popsicle sticks + place sprinkles on the top opening of the popsicle. Freeze overnight.